Elizabeth Bailey is back teaching at Southern Maine Community College after 10 days in Sochi. BRUNSWICK – Elizabeth Bailey wasn’t concerned about her nerves or her heart rate this Saturday morning. Her son had one more event in Sochi in the men’s relay biathlon before his Winter Olympics were done. Mom expected Lowell Bailey to do just fine. As long as he kept his heart rate down when he sighted his target and squeezed the trigger of his rifle. Elizabeth Bailey left Sochi behind on Monday, three days after Lowell finished eighth in the 20-kilometer individual race, the best finish ever by an American. With little more than a couple of deep breaths, some sleep and tea, she was back teaching nursing students on the Southern Maine Community College campus at the former Brunswick Naval Air Station. This Saturday morning she was in front of two computer monitors for the relay race, one streaming Lowell’s performance and the other charting race times and targets hit – or missed – by all the teams. It’s been a whirlwind month for the divorced mother of two but she knew that before it began. She’s done her share of traveling, to Turin, Italy, for the 2006 Winter Olympics and Vancouver, British Columbia, for the 2010 Games. Countless other trips to World Cup events. Lowell is 32 and a veteran biathlete well known to other competitors and fans. That mindset helped last week. 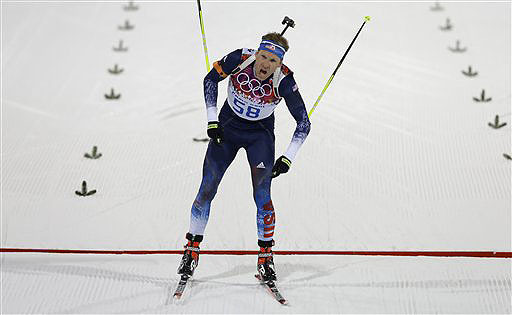 His 2014 Winter Olympics started with a 36th place in the 10K sprint. He followed with a 38th in the pursuit race. Neither race was a confidence builder. Lowell made himself forget. “The first person I saw after the (pursuit) was my mom. I realized, here’s the reason I’m here, essentially,” he told the Adirondack Daily Enterprise newspaper from his hometown of Lake Placid, N.Y.
His next race was the 20K individual and the eighth place. 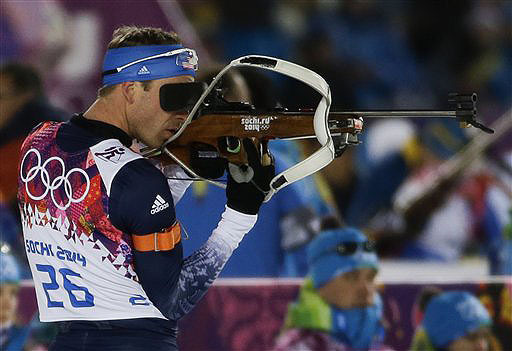 The performance didn’t earn him a medal but it was a benchmark for the entire U.S. biathlon team. She’s been a professor of nursing at SMCC for nearly three years. Her colleagues have learned about the biathlon through her but the education is ongoing. Someone asked Elizabeth what her son’s job was when he wasn’t skiing and shooting a rifle. That’s his job, mom said. Six days a week, 11 months out of the year. Training and meetings with coaches, and workouts and more training. Elizabeth grinned. You can talk to Americans about hockey, downhill skiing and figure skating. The biathlon is a mystery. But not to northern Europeans. In the Olympic stadium, Elizabeth was typically surrounded by Russian fans. One got quite excited when he discovered she was the mother of Lowell Bailey. She couldn’t follow his Russian and asked someone to translate. The fans, she said, weren’t wrapped up in their country’s flags. Cheering was universal for good performances. After three Olympiads and many World Cup events, Elizabeth knows Americans might not understand. She saw the glitter of the newly constructed Olympic venues and hotels, and she saw poverty elsewhere. She felt safe but also disconcerted in this extreme world of haves and have-nots. She flew back to Maine and her daughter, Kendra Bailey, 28, who lives in Portland. Mom is a happy woman. Lowell Bailey is still living a dream.